The First クリスマス Card - 1843 (Christmas 2008). 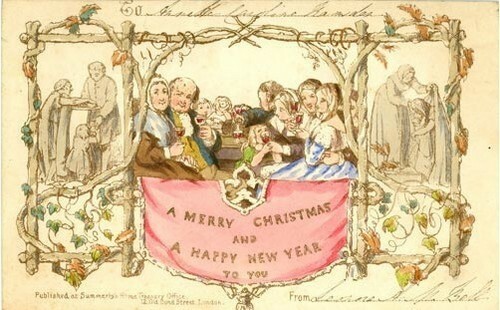 This is the first commercial クリスマス card issued in London,England in 1843, illustrated によって John Callcott Horsley. Each card sold for one shilling at the time.. Wallpaper and background images in the クリスマス club tagged: christmas 2008 cards first christmas card vintage photo. This is the first commercial クリスマス card issued in London,England in 1843, illustrated によって John Callcott Horsley. Each card sold for one shilling at the time. It seems very strange to be able to view the very first xmas card it is very detailed and expensive for its time i might had! Yes, I do believe i shilling was considered a lot at that time.